A ROW OVER speaking time for independent TDs has seen the Dáil suspended for the rest of the day – but not before three independent TDs were kicked out of the chamber. The row began during the Order of Business when the Dáil Technical Group whip Catherine Murphy complained about a letter the Ceann Comhairle Seán Barrett sent to Reform Alliance TD Lucinda Creighton. The letter stated that Barrett was prepared to exercise his right under Dáil standing orders (rules) to allocate speaking time to Reform Alliance TDs if they were not included in speaking slots by the Technical Group – to ensure all members have fair access to speaking time. Murphy and fellow independent and Technical Group member John Halligan accused the Ceann Comhairle of interfering with the running of the Technical Group. But Barrett argued that he had a right under standing orders to ensure that all TDs have sufficient speaking time. 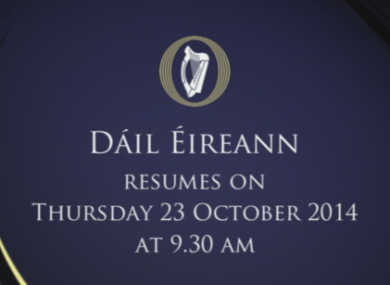 The Ceann Comhairle suspended the Dáil temporarily a number of times before finally suspending debate for the rest of the day shortly after 2.30pm. The Ceann Comhairle's decision to suspend the sitting is a result of his refusal to listen to a genuine issue re democratic process. Beforehand, TDs voted 69-40 to evict Murphy, 74-42 to kick out Halligan and 72-42 to suspend Thomas Pringle. With the Dáil not in session next week, Murphy and Halligan have been suspended until 6 November while Pringle is suspended until 4 November. All three deputies will lose wages for any sitting days they are suspended for the Dáil. As she left the Chamber, Murphy said that independent TDs were being discriminated against. Speaking to reporters outside Leinster House this afternoon, Halligan said that Creighton had agreed that extra resources should be given to Technical Group but had refused to provide any funding for the staff that the group employs. “She actually agreed that there was extra resources needed if extra people were to join the Technical Group,” he said, adding that he felt shafted by Creighton. Murphy said that forcing the suspension of the house for the rest of the day was “the last thing I wanted to do” but said they felt they had no option as independents are being “discriminated against”. Changes to standing orders would need to be debated at the Dáil’s Committee on Procedures and Privileges, the Ceann Comhairle told TDs. Earlier today, Peter Finnegan, the Dáil’s Clerk-Assistant, sent letters to Murphy and Creighton stating that it is up to the Ceann Comhairle to “interpret and apply the rules of the House”. He goes on to say that Creighton and fellow former Fine Gael TD Peter Mathews are now recognised as members of the Technical Group. In his letter to Creighton, Finnegan notes that while there is an arrangement in place whereby political parties and the Technical Group provide a list of speakers, this is predicated by “members being given fair access to speaking time”. To view the letters in full click here. Email “Three TDs have been suspended from the Dáil after a massive row”. Feedback on “Three TDs have been suspended from the Dáil after a massive row”.